Any towel warmer you choose to use will need plenty of steady electricity. Even as summer arrives, there’ll still be some chilly days. 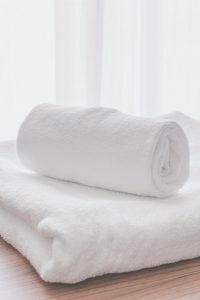 A warm towel can be a huge relief when you’re getting out of the shower in the morning or just stepping out of the bathtub. However, installing these features into your bathroom (or sometimes in your kitchen) can be trickier than you might think. You might have a towel rack on the back of the bathroom door. Putting the towel warmer on the back of the door only seems natural, but this is something you should avoid doing. When the door is left open, it will block ventilation to your towel warmer. Any heat can be trapped which will damage the door, the warmer, and the towels you hang on it, all of which can lead to a potential fire, electrical or not. You’ll also probably have drywall throughout your home. Whether you want to have it in your bathroom or be a little daring and have it in a different room, you can’t hang your towel warmer on drywall alone. You will need wall studs to support the weight of the towels – they might not be heavy when they are clean and dry, but when they are wet, sodden towels get much heavier. Proper installation means you won’t have to deal with the aggravation of a warmer always falling off the wall, or if it does injure someone when it does fall. Any towel warmer you choose to use will need plenty of steady electricity. That being said, you will need to ground the circuit to make it safer. If you don’t make sure that the wires are properly grounded, it could be an unexpected shock hazard. Shock hazards are never a good problem to have when there is water around. Lastly, be sure to stay away from putting a towel warmer too close to water. Between the sink, tub, and toilet, there is a high risk of an accident. If the automatic timer and the switcher get wet, they could short circuit. Keep the warmer at least a foot away from both the sink and the shower. You can also fit up to six towels on a towel warmer. Give them at least three hours to finish drying first. No matter what type of bathroom accessories and fixtures you choose, WalterWorks Hardware has the expertise and supplies you need. We are well known through the Maryland, Washington, D.C., and northern Virginia area for our fantastic hardware and unbeatable knowledge. For more information, please give us a call at (410) 263-9711 or contact us online. For more tips on choosing hardware for your home, follow us on Facebook, Twitter, LinkedIn, Houzz, Google+, and Pinterest. This entry was posted on Wednesday, June 6th, 2018 at 9:25 am. Both comments and pings are currently closed.